I had the pleasure of attending the grand opening of Texas designer- Elaine Turner’s latest boutique in the Alamo Heights neighborhood of San Antonio. The boutique is located in a small upscale strip mall with limited parking options on a busy day. But HUGE THANKS for the boutique for providing complimentary valet parking the evening of the event. 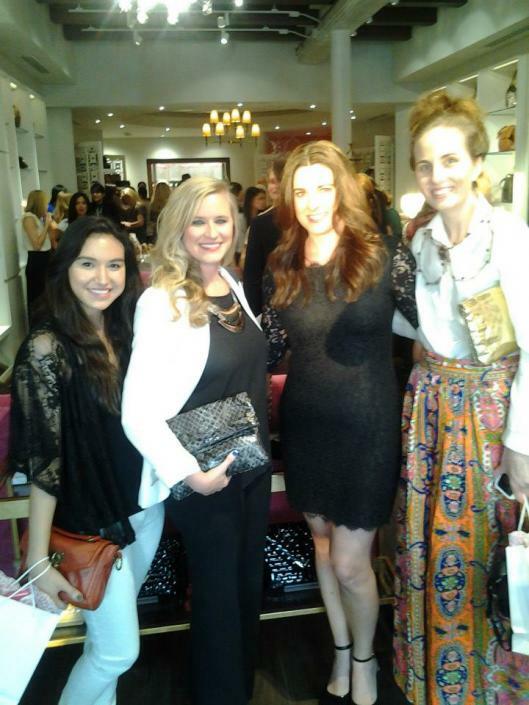 Once inside the boutique, I would feel the buzz and excitement as guests enjoyed the libations (sangria, wine and with decadent cupcakes provided by Kate’s Frosting) and checking out Elaine’s latest collections of jewelry, shoes and handbags. I love that Elaine’s collection offers affordable luxury that can be worn season to season. Her accessories collection is made so that the client can incorporate it into her everyday wardrobe all year long. Some of my favorite pieces include the: Bella in raffia and basket weave clutch, Rachel in metallic clutch, the Simone clutch, Eva heel in cheetah, Jaclyn heel and boy if I had an iPad, I’d sure get the python and cheetah zip cases. Highlights from the evening include: meeting new blogger friends from SAFABB, meeting the lovely (and uber-chic) staff of the boutique and briefly meeting Elaine Turner herself-such a sweet gal! Proceeds from purchases made during the event went to benefit Girls Inc. Check out all the girly goodness on ElaineTurner.com!